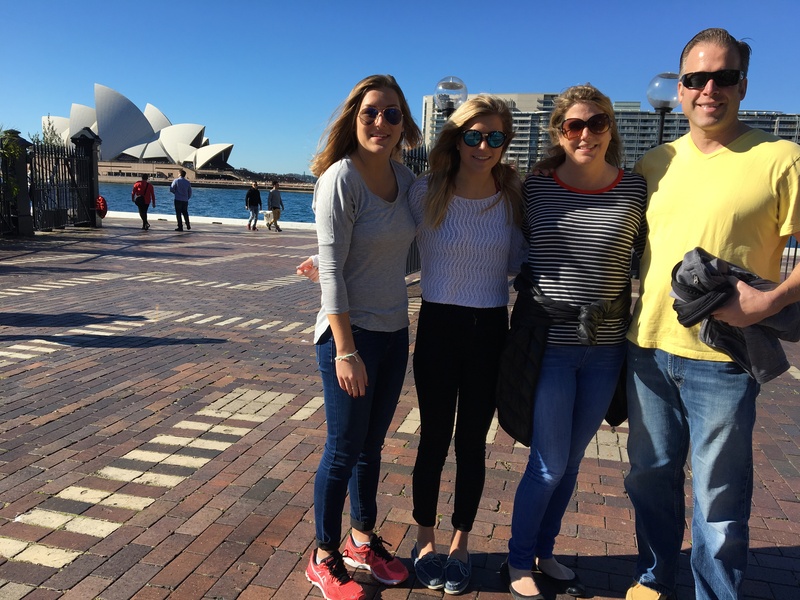 This June, I visited Australia on a 14-night trip with my wife Kay and daughters Sydney (20) and Kyndall (18). As many of you with grown children know, time goes by quickly. Now that our girls are both in college, trips like these are even more important to spend time together and create lasting family memories. Rather than sharing only my thoughts, I asked Kay, Sydney and Kyndall to share their trip highlights as well. I hope you enjoy our family trip report, and let me know if Australia (or Africa, South America, India or Southeast Asia) is next on your travel list! It’s difficult to name a favorite place we visited while in Australia; sort of like asking, “which child is your favorite?”! But certainly, Arkaba Station, a luxury eco-lodge in the Flinders National Park, comes to mind. Arkaba Station is the most unique of all the properties that we visited on our recent trip to Australia. We drove through the Flinders Ranges and arrived at Arkaba, a five-hour drive from Adelaide (or a 60-minute private air charter) and were met by Brendon Bevan, who has been the general manager there for the past 6 ½ years. My first thoughts were how amazing Arkaba Station is – out in the middle of nowhere – and how lucky we were to be there! My next thoughts, after meeting Brendon, were how special this place is and how passionate he is about its restoration and preservation. Arkaba Station is a 60,000-acre private conservancy, and was a working sheep station in the 1850s. With just five guest rooms (all with en-suite bathrooms,) it has a very warm and cozy feel. We were granted full access of the house, and welcomed to make ourselves at home, helping ourselves to any drinks or homemade goodies we wanted. Despite the close quarters, we felt we had privacy and lots of peace and quiet at night. All meals and activities were perfectly tailored to us. Both Matt and Luke (their 5-star chefs) did a fantastic job meeting our varied dietary needs. Brendon and Annie made sure we were all settled in and had all the comforts of home. We totally forgot we were at a “hotel” and felt like guests in their home. Shortly after arriving, we assembled for a wildlife drive. During our drive, we saw hundreds of kangaroos – Reds, Western Greys and Euros. We learned about each type and about the history of Arkaba. In 2009, Arkaba Station was purchased by Wild Bush Luxury. Successful conservation programs have been implemented focusing on feral species eradication and reversing the damage done by decades of livestock grazing. The property is constantly reviewing and improving strategies to minimize their impact on the environment – they provide guests with biodegradable bath products, collect and filter rain water, and use solar power when possible. We were driven to the base of Wilpena Pound for an easy 3km bushwalk to Arkaroo Rock. These Aboriginal rock carvings are very impressive and well worth seeing, and it was nice to have a bit of exercise rather than just driving. Later Brendan took us to see one of the campsites on the property. Arkaba Station offers a four day/three night walk for groups of up to 10 walkers, accompanied by expert guides. I was so sad we only had a couple of nights at Arkaba, instead of four days to do the walk! This is some of the most stunning walking country in the outback, and is packed with 600 million years of geological history! Camps are set up in the most spectacular locations on the property, where campers sleep out under the stars under newly-built shelters. At the end of each day walkers are greeted at a camp that has been assembled for them with a delicious three-course dinner and a collection of South Australian wines. At dusk, the kangaroos become very active, hopping about as you are having your dinner. The spot we visited had a fire pit area, great for an after-dinner drink with the ‘roos! Camp showers and loos are discreetly placed and offer spectacular views of the Wilpena Pound and Elder Ranges. 5-star camping? Sign me up! We will always look back fondly and be in awe of this amazing place. Many thanks to Brendan, Matt, Luke and Annie for welcoming us, and taking such good care of us. Following our unbelievable first Outback safari at Arkaba Station was an all-day road trip to Adelaide and a short plane ride to Kangaroo Island. This was the shortest flight I had ever been on, shorter than my daily drive to high school was and not even reaching cruising altitude! We were met by Evelyn, our first guide at Southern Ocean Lodge, for a 60-minute bus transfer. Even after a long day of traveling, the knowledge she shared about the island kept me wide awake – as well as the sudden stops we had to make as we yielded to the wallabies crossing the road. We arrived late at night to an illuminated, paradisiacal resort without knowing what was surrounding us, besides widespread woodland and the creatures that call it home. We were greeted by Angelique and Lucky, who showed us around the property and made sure every need was met and every expectation was surpassed. My sister, Sydney, woke me up in the morning by opening our bedroom curtain to reveal an incredible ocean view just past our door, as far as the eye could see. Though it is hard to tear yourself away from the luxurious lodge all afternoon, the activities on offer were even more amazing! Each of the included tours revolved around the flourishing wildlife on Kangaroo Island, and I never thought I’d see so many kangaroos, wallabies, koalas, seals and sea lions. We were very fortunate to visit Seal Bay during the breeding season, and our guide Shane knew everything there is to know about the animals. As we were returning from the tour, he made a spontaneous stop at the Hanson Bay beach where we watched a breathtaking sunset. Hanson Bay is also home to its own wildlife sanctuary where we went on the island’s famous Koala Walk. We were accompanied by our guide Stuart and the owner’s dog, Maggie, who would run in front of us, then freeze and stare at the treetops to alert us she’d spotted a koala! We returned with Evelyn to Hanson Bay Wildlife Center for the Nocturnal Tour, where we walked completely in the dark, shining flashlights into the treetops to reveal koalas and possums as groups of wallabies thumped past us! We ended the tour searching in the bushes for echidna – a porcupine-like mammal that lays eggs like a platypus – with no luck. But I ended up spotting one out the bus window in the daytime! Everything at Southern Ocean Lodge absolutely blew me away, from the moment we arrived until we said our goodbyes to the wonderful staff and departed the island. I would be thrilled to visit again someday. After we left Kangaroo Island, we arrived in Hobart, a very quaint harbor city on Tasmania. We got there quite late and headed by car the next morning on a 4-hour road trip to Cradle Mountain. At the entrance of Peppers Cradle Mountain Lodge, it felt like we were at a lodge up north in Minnesota! It took me a second to place where I was in the world, and it felt surreal that we were on an island so far from home. The landscape was stunning: thick forests, flowing rivers and towering cliffs with sharp peaks. We checked into the main lodge and they directed us to our cabin, explained where we could see wombats roaming the property and informed us of the Tasmanian devil sanctuary nearby. We were overjoyed at the chance to see these rare animals because that’s the main reason we wanted to go to Tasmania! The next morning, we headed straight for Devils @ Cradle Mountain, where we signed up for the evening feeding tour. We took a stroll through the enclosures and learned all about Tasmanian devils, their habitat and the programs in place to diversify their gene pool to prevent the spread of diseases that are threatening the devils’ existence. We came back that evening to see the Tasmanian devils being fed. This was quite a spectacle – they certainly live up to the name devil! When we returned to the lodge, we chatted with the staff about the famous “four-o’clock wombat” we’d heard so much about. They verified the story we’d heard, that he strolls along the same path almost daily at 4pm, but said we may not see him because it was a rainy day. He walked over and checked and then shouted, “there he is!” I walked about 50 yards from the lodge, towards what looked like a short brown bush, and it turned out to be the wombat, who was grazing on the long grass and was totally relaxed as I stood about 20 feet away! Cradle Mountain Lodge has more than 20 self-guided walking paths ranging from 20 minutes to 9 hours long, but this short walk to say “hello” to the wombat was the only one in which I participated, as the weather was not in our favor that day. It was certainly an incredible addition to our vacation, and our visit to Australia would not have been complete without spending a few days in the land of the Tasmanian devils. After so much time in nature, we were ready for the modern conveniences of one of the world’s top-rated cities. Our first night in Sydney was spent at the Sydney Harbour Marriott. What a great location! We were surrounded by shopping and great restaurants and were located a couple blocks away from the Opera House and Harbour Bridge. Although this was their winter, we left the hotel to amble around for the morning with just a light jacket. The exchange rate was very favorable for us, so even though Sydney is a little pricey we got a bit of a break! Sydney Harbour’s Circular Quay is like Grand Central Station since almost all of Sydney is accessible by a vast ferry and rail network. It’s really easy to navigate, and the ferry can double as a harbor cruise! We opted to do a half-day trip to Manly Beach using the ferry system. The ferry allows for many low-cost touring options that can be planned on arrival depending on the weather. When we arrived at Manly Beach, we were surprised to find so many things to do! There are walking/hiking trails, bike paths, beach activities and even an outdoor mall! The maps allow a visitor to easily plan hikes and be on time for the return ferry. There is so much to see and do in Sydney, and three days did not feel long enough. I loved how safe it felt for our family, even for the girls to explore on their own at night. I was surprised that it never felt crowded or even like we were in a big city. Our family fell in love with Sydney and will definitely be back.